There’s never a week I go without having greens in the house. Spinach, kale, and chard are always in rotation. I also always have pots of greens growing on my patio. When I saw this recipe, I knew I wanted to do something similar but with greens. 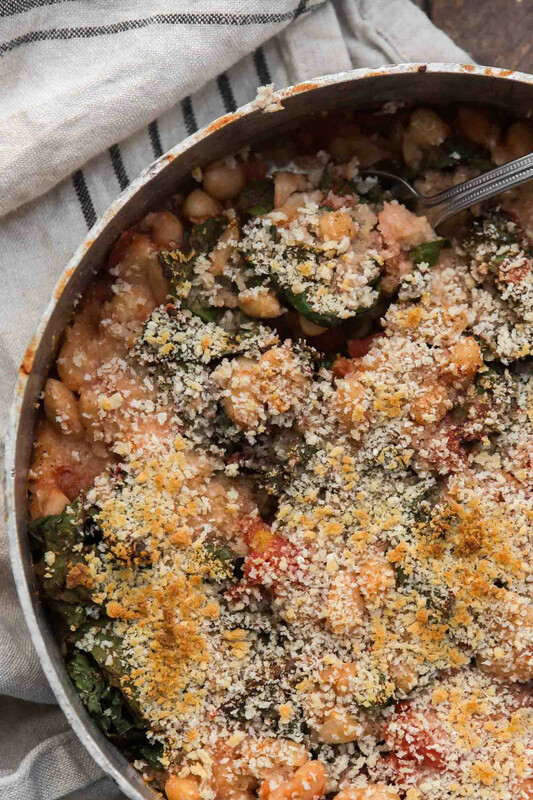 This chard bake is a solid base that you could easily add herbs and spices as you see fit. White beans and cans/jars of stewed tomatoes are also always stocked in my pantry. During the summer months, you could make your own tomato sauce and use that in place of the canned tomatoes. 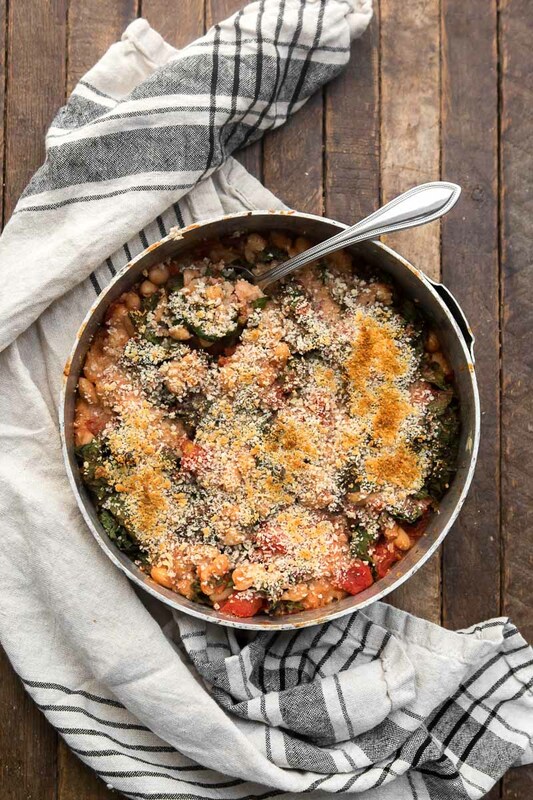 An easy pantry meal featuring creamy cannellini beans paired with fresh chard and canned stewed tomatoes. Perfect with a crusty slice of bread! Preheat the oven to 400˚F. Heat a medium, oven-safe skillet or cast iron pan over medium-low heat. Add the olive oil to the pan, followed by the garlic. Cook the garlic until fragrant and golden; 1 to 2 minutes. Stir in the chard, turn the heat to low, and cook until the chard just begins to wilt, 1 to 2 minutes. Stir the cannellini beans, stewed tomatoes, salt, and pepper into the chard mixture. Sprinkle the top with breadcrumbs. Place in the oven and bake for 20 minutes, until the tomato sauce is bubbling. Place the dish under the broiler if desired to brown the breadcrumbs more. Tips & Tricks: Make the greens ahead of time, like this garlicky green component. Links: Inspired by this recipe. Greens: swap out the chard for your favorite greens. A few of my favorites include kale, collards, and spinach. This would also be good with roasted cauliflower or broccoli. Spice: Stir in chili powder, smoked paprika, or even sambal oelek. You can add really any type of spice you might like/have on hand. Cheese: I like to leave this vegan because it’s a great go-to meal with the refrigerator is a bit empty. However, like in the recipe that this was inspired from, you could crumble feta or goat cheese on top before baking. I tend to choose kale over chard when it comes to cooked greens, but chard is easy to find year-round and just as easy to grow. 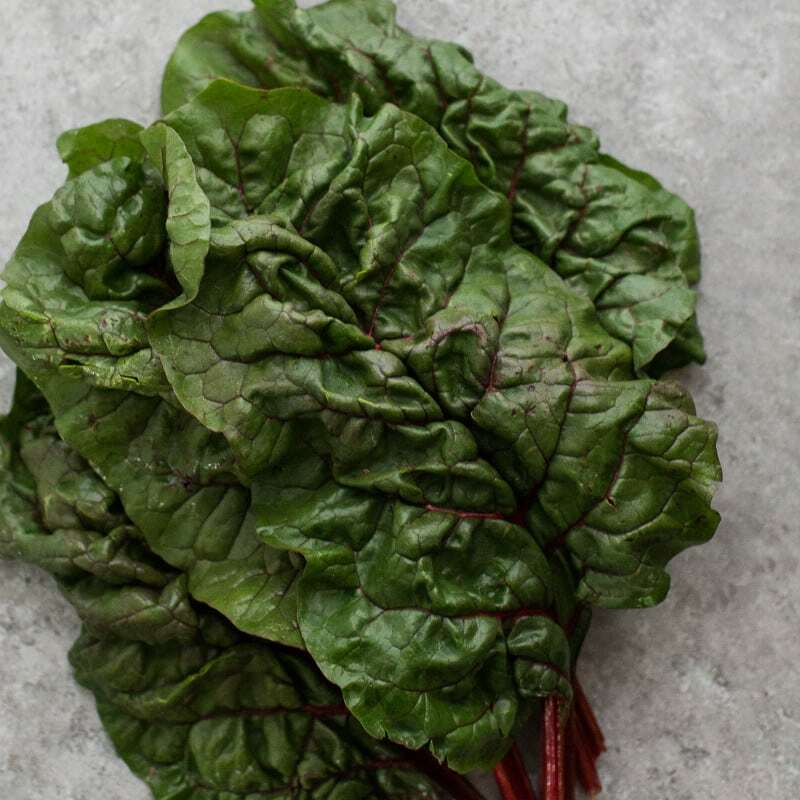 Chard cooks well and is a solid green for stews, grain bowls, and bakes. Don’t forget to save the stems- they are nice in stir-fries or made into pickles. This looks wonderful! I’ve tried similar things on my own and never thought of tomatoes mixed in, I think that might be exactly what was missing. In the last sentence of the first paragraph of directions you wrote “Stir in the stir”. I assume you meant “Stir in the chard” but assuming really fools me often so I wanted to check. Ah shoot- fixed! Thanks for the catch! This looks delicious. 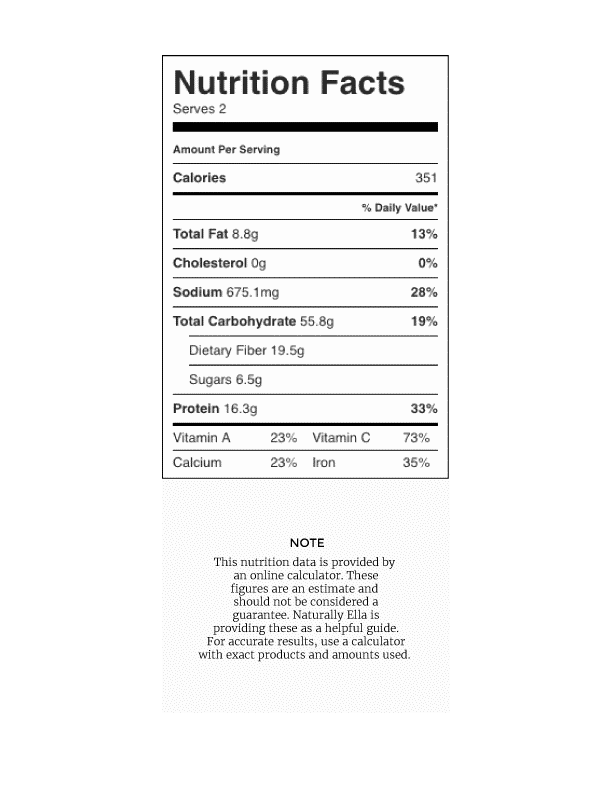 If I wanted to add roasted cauliflower or broccoli, at what step during the process would I add it to the pan? Also, I am a newbie cook, so please excuse my ignorance: would I roast the cauliflower/broccoli in the oven ahead of time, and then add to the pan, or simply cook it in the pan with the other ingredients? Thank you for your help. I’ve tried several of our recipes, and they have all been wonderfully delicious. No worries! I’d roast it ahead of time and then add it to the pan right before baking. You could also sauté the brassicas before adding the garlic (instead of roasting) and let it soften a bit. This might speed up the process. Thanks, Erin! Much appreciated. Can’t wait to give this recipe a whirl. I was a little sceptical when I threw everything in my skillet. It seemed like it might be watery or bland. Boy was I wrong! Went by the recipe with fantastic results fast. Thank you! This recipe has become a staple in my house. We have it nearly every week and still haven’t gotten tired of it. And that’s coming from two meat-eaters! I love this dish so much. 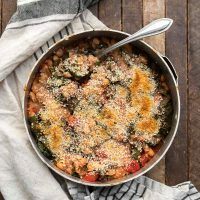 I use navy beans, add some red pepper flakes with the garlic, and a splash of red wine with the chard. SO freaking easy and good.